My friends laugh at me during the holidays when I dig out my DVD of a crackling fire and hit the play button. But then they do eventually admit that the video adds some wonderful ambience to my fireplace-less room — and they all end up looking great in the fire’s glow, eyes shining and skin warmed by that particular kind of light. A number of suggestions surfaced, from scary to heartwarming, movies like BLACK CHRISTMAS; FAMILY STONE; LADY IN THE LAKE; and one of my personal favorites, BELL, BOOK AND CANDLE with Jimmy Stewart falling head over heels under Kim Novak’s bewitching spell on Christmas Eve. Home Projectionist contributor Lindsay discovered Rod Serling’s dark version of A Christmas Carol, the made-for-tv CAROL FOR ANOTHER CHRISTMAS, starring Sterling Hayden and Peter Sellers, during her quest to watch a variety of different versions of the classic Dickens tale this year. She made it through seven! Home Projectionist blogger Dave identified a compelling and creative list of options inspired by the 12 Days of Christmas carol — for example, LITTLE WOMEN filed under the “Eight Maids A-Milking” verse — brilliant! And I am officially adding the holiday yule log video to the list. Enjoy basking in the glow … and have a lovely Christmas Eve and Christmas Day! I love my fireplace DVD for all the reasons you said. 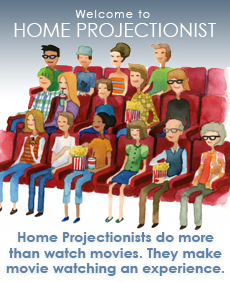 It has been fun to hang out at Home Projectionist this holiday season! Have a great Christmas, Lindsay! It’s been fun to connect this year.